The outdoor season is upon us, and the joys of getting outside are literally on our doorstep. What a wonderful time to bask in the glory that is mother nature, and revel in her relentless beauty and ability to nurture the body and mind. That is, until the insects show up, then the beauty of being outside in nature suddenly takes a miserable twist as these bugs start to take a bite out of our precious one-on-one time with the outdoors, and manage to turn this beautiful moment into a tainted experience. Good thing there’s insect repellent. This marvelous invention now allows us to enjoy the great outdoors without the fear of being molested by unscrupulous insects. Simply spray on the preferred deterrent, and you’re well on your way to whistling in the woods, free of any intrusive insect attack. Nothing could possibly go wrong now, right? Wait, let’s rewind the tape. With most conventional insect repellents, there is an active ingredient that has proven itself as an effective deterrent to bugs, and it was originally developed by the U.S. Army in 1946, following an experience with jungle warfare in World War II. This active ingredient is N, N-diethyl-meta-toluamide, commonly referred to as deet. Deet is found in nearly every commonly used mosquito repellent in the world, and over 8 billion doses have been applied since its introduction to the market in 1957. It became popular due to its effectiveness at repelling insects over a longer period of time, compared to more natural repellents. Then came the inconvenient truth. Research on deet showed that it functions the same way as deadly nerve gases and pesticides, by attacking the nervous system of both insects and mammals. And although researchers have insisted the chemical is safe, they still recommend that you use the minimum amount necessary to cover exposed skin or clothing, and many countries limit concentrations of this chemical to 30 or 50 percent. So if deet is “safe,” why would those caveats come with the use of it? After all, why would you want to limit the amount of deterrent to annoying insects, especially those that carry serious pathogens, like the Zika virus? “In experiments performed in cockroaches and rats, the researchers found that deet blocked the action of the neurological enzyme acetylcholinesterase. This is the same mechanism that causes the toxic effects of popular carbamate and organophosphate pesticides, as well as chemical weapons such as sarin and VX nerve gas. This may mean that deet repellants are actually insecticides and could damage the human nervous system. 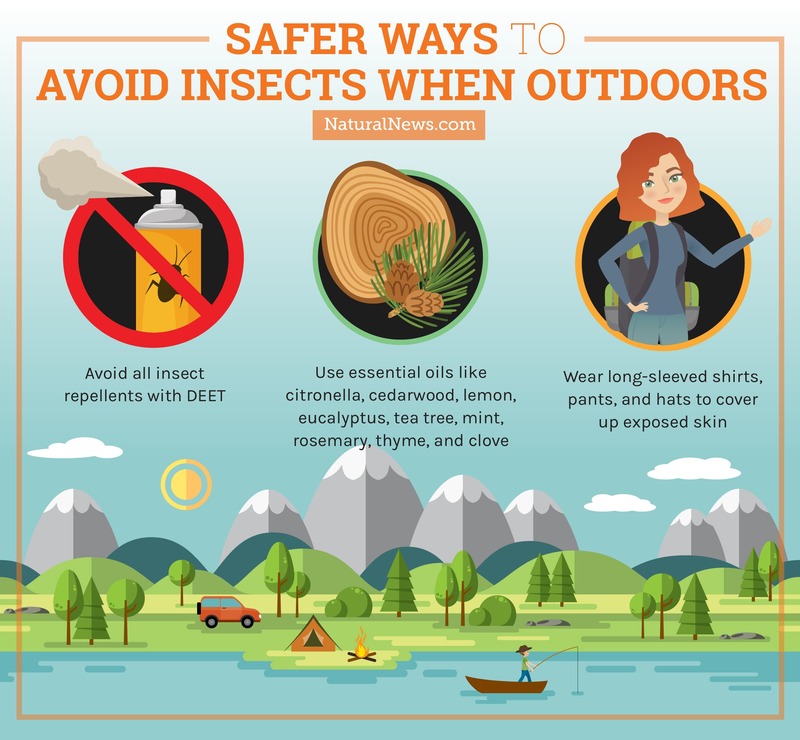 Considering that these chemicals can be absorbed into our physiology through transdermal application and involuntary inhalation, the prospect of using deet kind of loses its shine, doesn’t it? Do you really want to suffer the potential consequences, when there are much safer and effective options available? Of course not. Going into the outdoors is supposed to be enjoyable, not a prolonged suicide mission. So let’s find other ways to ward off these annoying and harmful insects. Fortunately, there are ways to enjoy the outdoors without being snacked on by pesky insects. One of the most obvious is to wear long-sleeved shirts and pants, and a hat, so you block direct access to most of your skin. This will work in certain situations, but admittedly, won’t be that fun in scorching temperatures of the summer heat. A more universal way to repel mosquitoes and other bugs is to apply natural based solutions that don’t aren’t toxic and that leave these insects dissuaded from your precious skin. These harmless options include essential oils such as citronella, cedarwood, lemon, eucalyptus, tea tree, mint, rosemary, thyme, and clove. Don’t worry if you smell like candles, bark, or ginger snaps, because at least you are covered, and not in a questionable neurotoxin. If you want to make your own insect repellent, you can find a couple of effective concoctions here. You can also take the easier route and stock up on the Health Ranger’s Bugs Away Spray, and enjoy a potent combination of nine essential oils in a base of witch hazel, which will moisturize your skin and leave you refreshed while creating a force field against unfriendly insects. Now, you’re a smart consumer, which solution sounds healthier and more effective to you?